Every child is an individual with unique characteristics. We provide a developmental approach that builds on children's interest, strengths, and emergent abilities. We also provide after-school care and turtoring help for older children. Field trips and homeade hot meals help with cognitive development and social skills. Get them ready for a future education in preschool first. 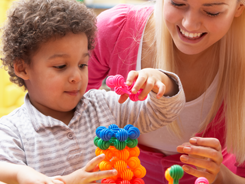 Kidcare Child Development Center in Victorville, California, provides quality child care for ages two to 12. Teachers provide field trips, hot meals, and tutoring to meet the children's needs. Our curriculum is designed to help the children succeed. We have a homework club to give them a chance to learn study skills and further improve their grades. Our founders have more than 35 years of experience in Early Childhood Education and Child Welfare collectively. Kidcare was started over 10 years ago so the owner would have an opportunity to go to work with her child. Over the years, they've established a curriculum to ensure that children move ahead of their peers once they reach kindergarten. We provide age-appropriate lessons and make certain that school age children understand their homework. Our founders are nurturing and concerned with your child's emotional well-being. They attend individualized education programs and advocate for parents and their children.